Rakusan did not include the Fan Series in his main sequence numbering. Therefore, the original number used for each of the 36 Series prints has been modified to identify the Fan Series members of its theme. The five different fan silhouette shapes have been here assigned arbitrary numbers 1 through 5. To indicate a fan design these shape designations are added to the 36 Series number separated by a hyphen. 134-4 is the Fan Series design with fan shape 4 in the 134 Sichuan Mallow theme. Like all other designs in this series, 134-4 was only produced in a single print run, and few copies are currently documented. The 134 Sichuan Mallow theme is one of the many entirely regular themes represented by a complete fan quintet and a color woodblock print. 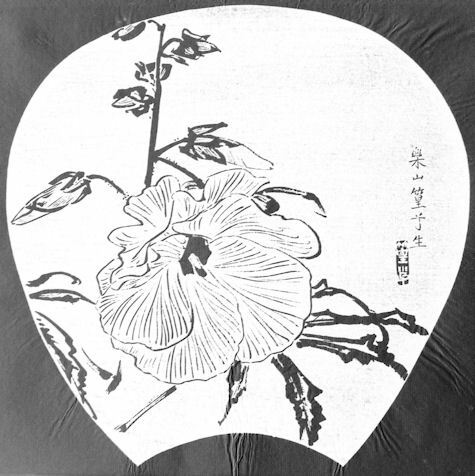 The Fan Series prints of the 134 Sichuan Mallow theme were distributed in early 1935 in installment twelve (of twelve), but the delivery documents for installment twelve remain to be discovered. The series as originally announced would have seen this last installment (and 36 Series design 134) published in December 1934. However, with previously documented delays the earliest month these could actually have been delivered is March 1935, and they may well have been even further delayed. All five Fan Series designs in this theme (including 134-4) have seal C which indicates a carving date during the first half of 1934. 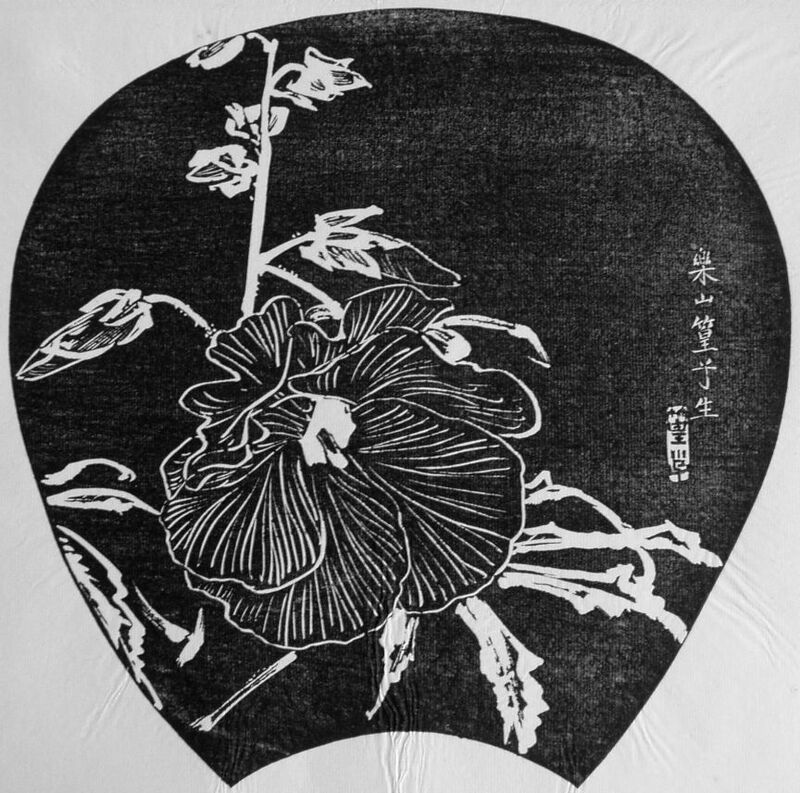 Despite the early completion of its wooden blocks, Rakusan delayed printing and distribution of the prints in what became the 134 Sichuan Mallow theme until the following year. It was eventually grouped with other summer season themes at the end of the series. Use of seal B on the 36 Series design 134 suggests it was carved somewhat later than the fan prints. The composition of 134-4 includes only a single stalk of sunset muskmallow including leaves, buds, and a distinctive open flower. The petals are rendered as detailed line drawings, and the stems and foliage in a more relaxed broad-brush technique. Both of which look equally well as ishizuri or reversed. Sunset Muskmallow (Aibika), Abelmoschus manihot, is originally a Southeast Asian exotic now widely grown in gardens. (It was formerly classified as Hibiscus manihot and called Sunset Hibiscus.) The plant is native to parts of Sichuan - hence the Chinese name taken over into Japanese, 黄蜀葵, おうしょっき, オウショッキ, ou-shok-ki, lit. 'yellow Sichuan mallow'. Today Sunset Hibiscus is usually called とろろあおい, トロロアオイ, tororo-aoi, but is spelled with the same kanji, 黄蜀葵, or abbreviated to 黄葵. 黄蜀葵 can today also be read tororo. The other species of mallow in theme 134 is Red Swamp Mallow (Scarlet Rosemallow, Texas Star), Hibiscus coccineus, which is native to the southeastern United States and has many English common names. It has become a favorite garden plant in Asia because of its brilliant scarlet-red flowers and its interesting, highly-dissected leaves. Despite its American origins, the resemblance to Sunset Muskmallow, Abelmoschus manihot, led to an older Japanese name for Red Swamp Mallow of 紅蜀葵, こうしょっき, コウショッキ, kou-shok-ki, lit. 'red Sichuan mallow'. Rakusan used this name 紅葉葵 in his title-caption for 57. However, today the most common Japanese name is based on the supposed similarity to the Japanese maple in red autumn colors, 紅葉葵, もみじあおい, モミジアオイ, momiji-aoi, lit. 'red-leaf (i.e. maple) mallow'. These two plants resemble one another and are both in the Malvaceae (Mallow) family, but they are in different genera and are not actually very closely related. Although the stems and dissected, palmate, leaves of the two plants look almost exactly the same, the shapes and colors of the five-petaled flowers are different. Notably the pistils are of different lengths, and where the pistil is shown, the species identification is clear in all flower forms.